Today I am touching on perhaps the most intense part of human growth: our Root. 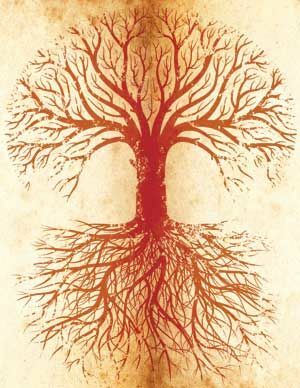 Throughout many cultures, religions and metaphysical ideologies, the Root is mentioned as that which connects a person to the Earth, or physical world. It is the realm of material, which includes every-single-thing around us as human beings. Not only that, but it is also our “power supply”, as well as the basis for ALL human relationships. I have always been underwhelmed by the focus on the Root- it seems it is briefly mentioned here and there seeing as we “spiritual people” are concerned with “higher” chakras; the good stuff: heart opening, third eye consciousness and getting your “crown chakra blown” (because that’s where Enlightenment happens… right?!). However today I am stressing that the root is perhaps THE most important aspect to heal and balance whilst in a human body on Earth, today. The reason for this is my experience that actually, the human soul incarnates from head to toe, but in natural development, the soul is earthed before returning back up to the crown. Traditionally we see the image of a snake rising from the base of the spine to the crown- however it is through my own exploration in these matters that actually human beings are born by “entering” the crown first, travelling “down” the spine, hitting the root and then reaching back up towards the crown (as long as natural development occurs). The problems occur when a human soul is not “grounded” or “earthed” properly. Although this being may be internally linked with higher consciousness, their ability to effect the physical Earth will be impossible unless they have fully permeated their Root. The whole point of being born human is that you are a bridge from the spiritual to the physical. If you are not fully grounded you cannot bridge that gap. There is also the other extreme, where beings are well grounded but remain locked into the physical world only. These people may be very successful in the material sense, but they will always feel a lack as they have been locked into root level, and have not made their way back to their spiritual home (this is well illustrated in myths of travelling to the underworld, or being sucked in by Maya). Now from what I understand, previous human generations (on the whole) did not have a problem with fully grounding into their root. Their main concern was travelling back up the system towards spiritual consciousness. However, for what-ever reason, (maybe a disconnection from nature) our natural development has been skewed and a lot of people- especially in the Western world, are failing to properly ground. This may be why we are seeing such a rise in human intelligence, thinking and abstraction (and therefore computer network technologies), but a lack of physical development as a species (which has a knock-on effect in nature). The growth of the human brain has been swift and language skills have exploded, however the physical human body has remained at a similar level of evolution- a huge imbalance is occurring. As well as the replacing of nature with media as children, mediaitized parents are the only example a new-born child has. We are also lacking a true set of spiritual “elders” with knowledge and grounding to teach the lessons of the spiritual realm, to hold and ground the spiritual knowledge on the Earth plane. Another problem that arises is the lack of knowledge about how the “imprint” of the parent impacts the incarnating child. This leads to stunted developmental growth, where we have adults that act like children or teenagers. In the long term, these issues can only serve to make the incarnation process more evolved, however, should human beings continue to fail to ground, the human species as we know it will cease to exist. On an individual level, as aware adults we can make sure we, ourselves, are fully grounded. You’ll know you aren’t because you feel unable to effect the physical world: it may seem like all too much. However, the only way TO effect the world, is to first change yourself. This is hard work. It means re-visiting all of those old traumas on a physical, human level. It’s not about sending light and love in meditation, it’s about physically healing those wounds: having those uncomfortable conversations, changing your diet, doing a physical exercise programme and getting outside in nature. It’s about connecting with your physical body, dancing, gardening, getting massages, dental hygiene. It’s about wearing quality clothes, using your voice and will in the world. It’s about practicing what you preach- and if you’re preaching love and light all day long, that is what you must do (even to every being who has ever “done you wrong”). It’s about your inner and outer world being in sync. The colour associated with the root is blood red- the liquid in our human bodies- the liquid that pours out of our wounds. The planet associated with the root is Mars- interestingly the planet of War. That’s not to say you must go to war with the world, but you must have the strength, courage, passion and endurance to stand for who you are, to say I Am. Grounding essential oils such as Frankincense, Cedar wood, Sandalwood, and Patchouli can be worn on clothing or added to a hot bath (as well as Himalayan salt). Yoga postures such as downward facing dog, table top, warrior pose, mountain pose, and tree. Lastly, any “root” vegetables are ideal when working on grounding- it’s all about making sturdy foundations within the Earth. Most of all, the Root is about accepting your circumstances and feeling secure in that acceptance. Yes- the world can be evil and unforgiving, unfair and cruel, but to be able to stand in that and hold your centre, is to belong to the Earth, and to accept your human life.